The GFF partnership has an opportunity now to support countries to accelerate progress on universal health coverage to save up to 35 million lives by 2030. This includes the collective efforts of all GFF partners supporting country leadership to ensure that economic growth translates into more and more efficient use of public resources for health and nutrition. The estimated lives saved of this study reflect the combined efforts that contribute to bending the curve on maternal, newborn and child mortality rates, including Gavi, the Vaccine Alliance; the Global Fund to Fight AIDS, Tuberculosis and Malaria; UNAIDS; and FP2020 contributions. With more than five million women and children dying every year from preventable causes, in large part due to a persistent and chronic underinvestment in quality, basic health and nutrition services, a radical change is required if countries are to take charge of their demographic future, reduce their reliance on external aid, build a healthy, working population, grow economies, and increase GDP. The GFF was founded in 2015 by the World Bank, Canada, Norway the United Nations and other partners, to help meet that challenge. As a pathfinder for innovative financing of the Sustainable Development Goals it is helping to address the unfinished agenda of women, children and adolescent health and nutrition and to close the financing gap. “For too long, the world’s poorest have been left behind, persistently underinvested in and deprioritized. We can change that—not only saving millions of lives, but dramatically improving the lives of many more women, children and adolescents, and helping countries to significantly improve their economic prospects,” said Mariam Claeson, Director of the GFF. The GFF partnership is working with the government of Nigeria to improve and expand primary health care services throughout the country. 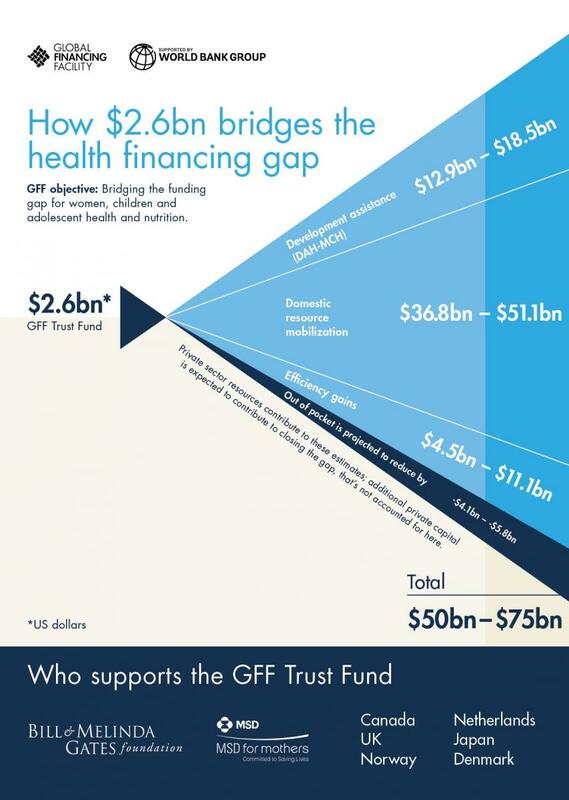 Today’s report in The BMJ Global Health quantifies the impact that the GFF partnership can have if it is able to raise the US$2 billion in GFF Trust Funds through its replenishment, to expand its support from 27 to all 50 countries with the greatest need. On November 6, 2018, the Governments of Norway and Burkina Faso, the World Bank Group, and the Bill & Melinda Gates Foundation will co-host an event in Oslo, Norway to galvanize support for the replenishment. "As countries continue their health financing transitions, it is key to ensure that resources generated by economic growth are used effectively—including directing more towards targeted priority health and nutrition areas. The plans of the GFF and its partners to facilitate these evolutionary changes in resource allocation could result in millions of lives being saved,” said Tom Cochrane of Cambridge Economic Policy Associates, London, UK. "Through the GFF there is a significant opportunity to plug the current gaps in essential care, and to not miss opportunities to administer critical interventions across the full spectrum of health needs of mothers and children. The global community has been very successful supporting programs that concentrate on specific interventions to fight diseases or particular health issues. What the GFF partnership brings is a way to support countries to build from that base an overall system that fits their needs. This approach will continue to transform health systems and save millions of lives in the years ahead,” said Neff Walker, Johns Hopkins Bloomberg School of Public Health, USA. A large proportion (approx. 70%) of the additional US$50 billion-US$75 billion funds for reproductive, maternal, newborn, child, adolesent, health and nutrition (RMNCAH-N) interventions would be mobilized from domestic resources—with governments significantly increasing their own commitments to health and nutrition financing over the long term. The private sector is considered an integral component of each of the above, and additional private sector capital is expected to be mobilized with the GFF. The GFF 1) establishes a country-led platform to ensure country ownership and leadership; (2) develops an investment case and implementation plan prioritizing reproductive, maternal, newborn, child and adolescent health and nutrition and improving efficiency; and (3) works with countries to mobilize the financial resources to accelerate progress on universal health coverage and to scale and sustainably finance health and nutrition. RMNCAH-N—including greater access to family planning methods, increased quality and coverage of antenatal and postnatal care, nutrition programs, vaccinations and education. These intervenions form the backbone of essential primary health care services and are the foundation of a healthy society. The GFF uses small amounts of Trust Fund money to draw in increased financing for health and nutrition—with countries increasing domestic resources, aligning external and concessional financing, and leveraging the private sector. The GFF also establishes innovative financing mechanisms to widen the pool of financing that countries can draw on, and making that money more affordable for countries to use. [i] The GFF is a broad country-driven partnership. Globally the GFF Investors Group includes GFF countries, the Bill & Melinda Gates Foundation, which currently chairs the GFF’s Investors Group; the World Bank Group, which houses the GFF; Gavi, the Vaccine Alliance; the Global Fund to Fight AIDS, Tuberculosis and Malaria; the United Nations; MSD for Mothers and other private sector partners; civil society; the governments of Canada, Denmark, the Netherlands, Norway, Japan, the United Kingdom and the United States; and other partners. [iv] Historic trend. Resource growth is consistent with current trends. Therefore, in this scenario, coverage of current health interventions being delivered increase at the same historic rate as they have in the past, assuming continuation in official development assistance growth for health driving coverage at historic rates. Country-specific trends are based on an analysis of available data from large nationally-representative household surveys using a multi-level modelling approach based upon general principles described previously. Projections of vaccine coverage were applied from Gavi, the Vaccine Alliance, based on their expected country-specific implementation. HIV/AIDS intervention trends are from the UNAIDS Reference Group, which includes Global Fund to Fight AIDS, Tuberculosis and Malaria; PEPFAR; USAID and others. Contraception follows projected trends from UN Population Division 2017 Revision of World Population Prospects. Malaria includes country targets from the Global Fund.